New pavement on the I-5 ramp at Boylston. The last part of the Boylston noise wall project is nearing completion. 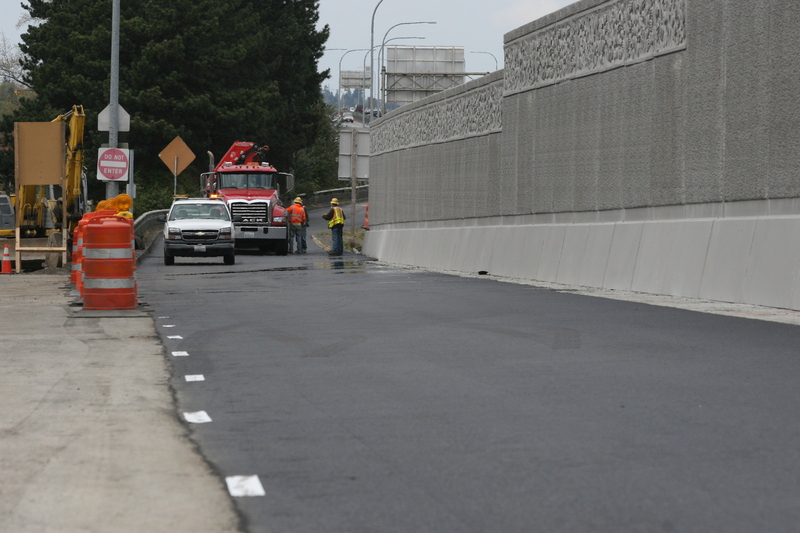 State Department of Transportation crews have finished repaving Boylston at the southbound I-5 exit. According to the DOT, the ramp should be open by 8 p.m. this evening (Saturday) unless they open it earlier. Crews are currently reinstalling barriers. Even more important, the barriers that blocked access to Boylston at Hamlin and Edgar have been removed. This will make it easier for residents in this part of Eastlake (of which I am one) to get to the freeway and Capitol Hill. Tonight also brings the last weekend closure of the University Bridge, from midnight to 6 a.m. This closure is part of the ongoing painting project on the bridge. This entry was posted in Uncategorized on April 25, 2009 by cdmilton.